Drink: Villa Jolanda Moscato d'Asti | CookDrinkFeast! The family and I decided to cook ham for our Christmas main dish. My parents don’t normally drink wine so I wanted to choose something easy-drinking and approachable. For the past few year’s I’ve been bringing German Rieslings to holiday dinners because they are so food friendly. But this time I wanted to try something different. “It’s a beautiful bottle,” my mom exclaimed when I brought out the Villa Jolanda Moscato d’Asti. The clear bottle is shapely and faceted. The wine is a straw yellow. It might just be me but I found the cork to be extremely difficult to remove. The cork is not the typical mushroom-shape that is usually found in sparkling wine bottles. One needs a corkscrew to remove it and it is particularly dense. This wine is frizzante – meaning that it is slightly sparkling with bubbles that come from a partial second fermentation. The nose has the scent of ripe peaches. It is sweet with peach, apricot, and floral notes on the palate. Mom and Dad really enjoyed this wine. So did I. Mom even asked for a refill, something she rarely does with wine. 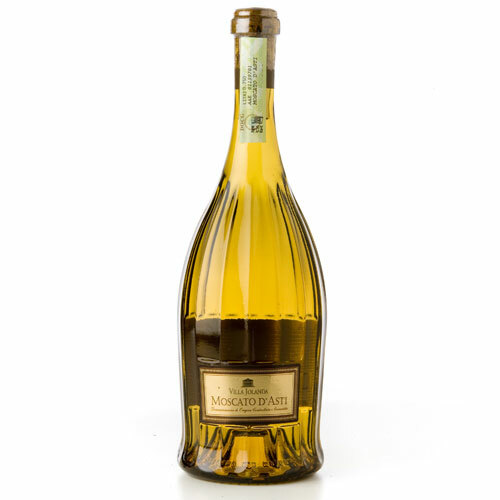 Moscato d’Asti is typically recommended as a dessert wine. However I would also suggest pairing it with spicy Szechuan or Thai food.